There is nothing worse than on a long ride and your taste buds giving up on you because of the sugary overload through taking a regular gels. The taste of the Secret Training selection thankfully didn't do this. We've all been there, out on a long ride or a high intensity short ride, when the legs give out. The mind is willing but the body is depleted in terms of energy to keep the power going. 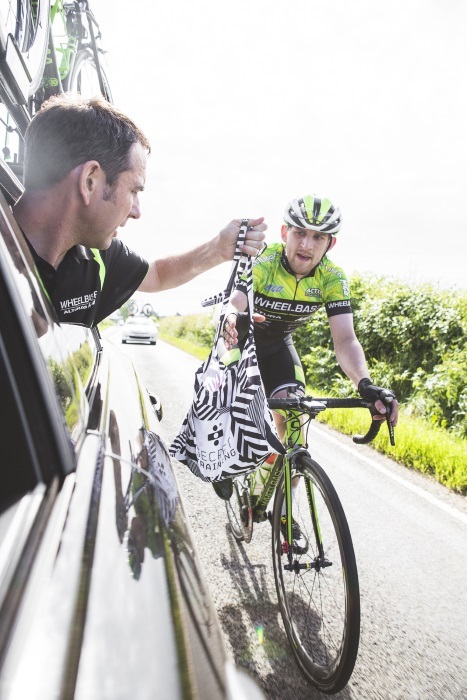 So what do you do when you're on the bike and you feel those energy levels start to drop? You need to fuel your body to enable it to maintain the effort. Nutrition on the move is really important. This is where energy products come into play and Secret Training, founded by European Champion Track cyclist, Tim Lawson know a thing or two about this subject. Secret Training supply Pro Team, Tinkoff and the continental team JLT Condor. Tim's vision began when he read the horrifyingly long list of ingredients included in energy products and decided there was a clearly an opportunity to create a better formula. The range of gels created by Secret Training contain water making them easier to digest and remove the need to take on board additional water. The flavours are bold and fruity, almost a smoothie in a packet. When you first view the products you are struck by the vivid colours used in the packaging, a hint of the flavours packed inside. They are easy to open and the new flavours are particularly good. The Mango and Passion Fruit and the Forest Fruit flavours I tried were great. Each 60ml gel feels heavier than most other options on the market, in thanks to containing real fruit and water. Other ingredients include energy substrates, sticky rice starch and fructose to complete the package. They are easy to digest but even with the bigger flavours your taste buds don't feel over-whelmed. It isn't quite a chewy bar but you feel better for something a little more substantial but easy to digest. The Forest Fruit flavour is an isotonic gel, providing a quicker boost of energy to your muscles. Both flavours are suitable for vegans. There is nothing worse than on a long ride and your taste buds giving up on you because of the sugary overload through taking a regular gels. The taste of the Secret Training selection thankfully didn't do this. My only reservation with the slightly bulkier gels is following the advised plan of 3 an hour it will make your jersey pockets bulge. A minor point but worth carrying the extra load if you want to treat your palette. To read more on how to fuel for a long distance ride, click here. We all know well how to unblock youtube videos at http://unblockedtube.net/ and now this is another way to get the unblocked videos here. The vast degree of element and know-how that has long gone into the improvement of the STEALTH range is clear in the course of. every component has been carefully notion out, attempted and examined; from the multiple transportable carbohydrates and avoidance of artificial sweeteners within the isotonic variety, to the easy digestibility of the caffeine and betaine gel. <a href=https://vk.com/casinororg>Ð˜Ð³Ñ€Ð°Ñ‚ÑŒ Ð² Ð¸Ð·Ð²ÐµÑ�Ñ‚Ð½Ñ‹Ðµ Ð²Ð¸Ñ€Ñ‚ÑƒÐ°Ð»ÑŒÐ½Ñ‹Ðµ Ñ�ÐµÑ€Ð²Ð¸Ñ�Ñ‹</a> Ð²Ñ‹ Ð¼Ð¾Ð¶ÐµÑ‚Ðµ ÐºÐ°Ðº Ð² demo Ð²ÐµÑ€Ñ�Ð¸Ð¸, Ñ‚Ð°Ðº Ð¸ Ð½Ð° Ð½Ð°Ñ�Ñ‚Ð¾Ñ�Ñ‰Ð¸Ðµ Ð´ÐµÐ½ÑŒÐ³Ð¸. Ð�ÑƒÐ¶Ð½Ð¾ Ð¾Ñ‚Ð¼ÐµÑ‚Ð¸Ñ‚ÑŒ Ð¸Ð³Ñ€Ñƒ Ð² Ð¾Ð½Ð»Ð°Ð¹Ð½ casino Ð½Ð° Ð´ÐµÐ½ÑŒÐ³Ð¸, Ð³Ð´Ðµ Ð²Ñ‹ Ð¼Ð¾Ð¶ÐµÑ‚Ðµ Ð¿Ð¾Ð»ÑƒÑ‡Ð°Ñ‚ÑŒ Ð¾Ñ‚Ð»Ð¸Ñ‡Ð½Ñ‹Ðµ Ð±Ð¾Ð½ÑƒÑ�Ñ‹. Ð'Ð¾Ð»ÑŒÑˆÐ¸Ð½Ñ�Ñ‚Ð²Ð¾ Ð¾Ð½Ð»Ð°Ð¹Ð½ ÐºÐ°Ð·Ð¸Ð½Ð¾, ÐºÐ¾Ñ‚Ð¾Ñ€Ñ‹Ðµ Ð²ÐµÐ´ÑƒÑ‚ Ñ�ÐµÐ±Ñ� Ñ‡ÐµÑ�Ñ‚Ð½Ñ‹Ð¼ Ð¾Ð±Ñ€Ð°Ð·Ð¾Ð¼, Ð¿Ñ€ÐµÐ´Ð¾Ñ�Ñ‚Ð°Ð²Ð»Ñ�ÑŽÑ‚ Ð±ÐµÐ·Ð´ÐµÐ¿Ð¾Ð·Ð¸Ñ‚Ð½Ñ‹Ðµ Ð±Ð¾Ð½ÑƒÑ�Ñ‹. Ð£ Ñ€Ð°Ð·Ð½Ñ‹Ñ... Ð¿Ð»Ð°Ñ‚Ñ„Ð¾Ñ€Ð¼ Ñ€ÐµÐ¿ÑƒÑ‚Ð°Ñ†Ð¸Ñ� Ð¾Ñ†ÐµÐ½Ð¸Ð²Ð°ÐµÑ‚Ñ�Ñ� Ð»ÑŽÐ´ÑŒÐ¼Ð¸, ÐºÐ¾Ñ‚Ð¾Ñ€Ñ‹Ðµ Ñ‚Ð°Ð¼ Ð¸Ð³Ñ€Ð°ÑŽÑ‚. Ð*Ñ�Ð»Ð¸ Ð¿Ð¾Ñ�ÐµÑ‚Ð¸Ñ‚ÐµÐ»Ð¸ Ñ� Ð¸Ð¼ÐµÐ½ÐµÐ¼ Ð¸Ð³Ñ€Ð°ÑŽÑ‚ Ð½Ð° ÐºÑ€ÑƒÑ‚Ñ‹Ñ... Ð¿Ð¾Ñ€Ñ‚Ð°Ð»Ð°Ñ..., Ñ‚Ð°ÐºÐ¸Ðµ Ð¿Ð¾Ñ€Ñ‚Ð°Ð»Ñ‹ Ð¾Ð±Ð»Ð°Ð´Ð°ÑŽÑ‚ Ð»Ð¸Ñ†ÐµÐ½Ð·Ð¸ÐµÐ¹. ÐšÐ°Ðº Ð¿Ñ€Ð°Ð²Ð¸Ð»Ð¾, Ñ‚Ð°Ð¼ Ñ€ÐµÐ°Ð»ÑŒÐ½Ð¾ <a href=https://www.facebook.com/groups/casinor.net/>Ð¸Ð³Ñ€Ð°Ñ‚ÑŒ Ð² Ð¸Ð³Ñ€Ð¾Ð²Ñ‹Ðµ Ð°Ð¿Ð¿Ð°Ñ€Ð°Ñ‚Ñ‹ Ð½Ð° Ð´ÐµÐ½ÑŒÐ³Ð¸</a>. Ð*Ñ�Ð»Ð¸ Ð²Ñ‹ Ð¶ÐµÐ»Ð°ÐµÑ‚Ðµ Ð½Ð° Ñ€ÐµÐ³ÑƒÐ»Ñ�Ñ€Ð½Ð¾Ð¹ Ð¾Ñ�Ð½Ð¾Ð²Ðµ Ð²Ñ‹Ð¸Ð³Ñ€Ñ‹Ð²Ð°Ñ‚ÑŒ Ð±Ð¾Ð»ÑŒÑˆÐ¸Ðµ Ð´ÐµÐ½ÑŒÐ³Ð¸, Ð²Ð°Ð¼ Ð½ÐµÐ¾Ð±Ñ...Ð¾Ð´Ð¸Ð¼ Ñ€ÐµÐ³ÑƒÐ»Ñ�Ñ€Ð½Ñ‹Ð¹ Ð´Ð¾Ñ...Ð¾Ð´. ÐŸÐµÑ€Ð²Ð¾Ðµ Ð²Ñ€ÐµÐ¼Ñ� Ð½Ðµ Ð²Ñ‹Ð¹Ð´ÐµÑ‚ Ð²Ñ‹Ð¸Ð³Ñ€Ñ‹Ð²Ð°Ñ‚ÑŒ Ð±Ð¾Ð»ÑŒÑˆÐ¸Ðµ Ð´ÐµÐ½ÑŒÐ³Ð¸. ÐžÐ´Ð½Ð°ÐºÐ¾, ÐºÐ°Ð¶Ð´Ñ‹Ð¹ Ð¿Ð¾Ñ�ÐµÑ‚Ð¸Ñ‚ÐµÐ»ÑŒ Ð¼Ð¾Ð¼ÐµÐ½Ñ‚Ð°Ð»ÑŒÐ½Ð¾ Ñ€Ð°Ð·Ð±ÐµÑ€ÐµÑ‚Ñ�Ñ� Ñ� ÐºÐ°Ñ‚Ð°Ð»Ð¾Ð³Ð¾Ð¼ Ð¸Ð³Ñ€. Ð¡Ñ€ÐµÐ´Ð¸ Ð¿Ð¾Ð¿ÑƒÐ»Ñ�Ñ€Ð½Ñ‹Ñ... Ð°Ð²Ñ‚Ð¾Ð¼Ð°Ñ‚Ð¾Ð² ÐµÑ�Ñ‚ÑŒ Ñ€Ð°Ð·Ñ€Ð°Ð±Ð¾Ñ‚ÐºÐ¸ Ð¾Ñ‚ Novomatic, IgroSoft, Microgaming Ð¸ Ð´Ñ€ÑƒÐ³Ð¸Ðµ. Ð' 2005 Ð³Ð¾Ð´Ñƒ Ð¿ÑƒÐ±Ð»Ð¸Ñ‡Ð½Ñ‹Ð¹ Ð¾Ð±Ð¾Ñ€Ð¾Ñ‚ Ñ�Ñ‚Ð¾Ð¹ Ñ�Ñ„ÐµÑ€Ñ‹ Ñ�Ð¾Ñ�Ñ‚Ð°Ð²Ð»Ñ�Ð» ÑˆÐµÑ�Ñ‚ÑŒ Ð¼Ð¸Ð»Ð»Ð¸Ð°Ñ€Ð´Ð¾Ð² Ð´Ð¾Ð»Ð»Ð°Ñ€Ð¾Ð².Ð Ð¾Ñ�Ñ�Ð¸ÑŽ Ð¾Ñ...Ð²Ð°Ñ‚Ð¸Ð»Ð° Ð¸Ð³Ñ€Ð¾Ð²Ð°Ñ� Ð»Ð¸Ñ...Ð¾Ñ€Ð°Ð´ÐºÐ°.Ð�Ð"ÐœÐ˜Ð�Ð˜Ð¡Ð¢Ð Ð˜Ð ÐžÐ'Ð�Ð�Ð˜Ð* Ð¡Ð�Ð™Ð¢Ð� ÐžÐ¡Ð£Ð©Ð*Ð¡Ð¢Ð'Ð›Ð¯Ð*Ð¢ Ð�Ð�Ðž "Ð¡ÐšÐ£ÐšÐ˜.Ð�Ð*Ð¢" Ð' Ð Ð�ÐœÐšÐ�Ð¥ Ð¡ÐžÐ¦Ð˜Ð�Ð›Ð¬Ð�ÐžÐ"Ðž ÐŸÐ ÐžÐ*ÐšÐ¢Ð� "SKUKI.Ð�Ð° Ð½ÐµÐ³Ð¾ Ð¿Ñ€Ð¸Ñ�Ñ‚Ð½Ð¾ Ð´Ð°Ð¶Ðµ Ð¿Ñ€Ð¾Ñ�Ñ‚Ð¾ Ð·Ñ€ÐµÑ‚ÑŒ.Ð' Ñ‚Ð¾Ð¹ Ð¶Ðµ Ð¼ÐµÑ€Ðµ Ñ�Ñ‚Ð¾ Ð¾Ñ‚Ð½Ð¾Ñ�Ð¸Ñ‚Ñ�Ñ� Ð¸ Ðº Ñ�Ð»Ð¾Ñ‚Ñƒ Alchemist's Lab Ñ‚Ð¾Ð³Ð¾ Ð¶Ðµ Ð²ÐµÐ½Ð´Ð¾Ñ€Ð°.Ð­Ñ‚Ð¾ Ð³Ñ€ÐµÑˆÐ½Ð¾ Ñ‚Ñ€Ð°ÐºÑ‚Ð¾Ð²Ð°Ñ‚ÑŒ, ÐºÐ°Ðº Ð¿Ñ�Ñ‚Ð½Ð¾ Ð¸Ð»Ð¸ Ð²Ð°Ð¶Ð½Ð¾Ñ�Ñ‚ÑŒ Ñ�Ð»Ð¾Ñ‚-Ð°Ð²Ñ‚Ð¾Ð¼Ð°Ñ‚Ð° -- Ð¾Ñ‚Ð½Ð¾Ñ�Ð¸Ñ‚Ðµ Ð¾Ð¿Ñ†Ð¸ÑŽ Ðº Ð¾Ñ�Ð¾Ð±ÐµÐ½Ð½Ð¾Ñ�Ñ‚Ñ�Ð¼ Â«Ð¾Ð´Ð½Ð¾Ñ€ÑƒÐºÐ¾Ð³Ð¾ Ð±Ð°Ð½Ð´Ð¸Ñ‚Ð°Â» Ð½Ð° Ñ„Ð¸Ð½Ð°Ð½Ñ�Ñ‹.ÐŸÐµÑ€Ð²ÐµÐµ Ð²Ñ�ÐµÐ³Ð¾ Ñ‡ÐµÐ¼ Ð² Ð°Ð²Ñ‚Ð¾Ð¼Ð°Ñ‚Ñ‹ Ñ€ÐµÐ·Ð²Ð¸Ñ‚ÑŒÑ�Ñ� Ð½Ð° Ð·ÐµÑ€ÐºÐ°Ð»Ðµ Ð¾Ð½Ð»Ð°Ð¹Ð½ ÐºÐ°Ð·Ð¸Ð½Ð¾ Ð¸Ð»Ð¸ Ð½Ð° ÐµÐ³Ð¾ Ð¾Ñ„Ð¸Ñ†Ð¸Ð°Ð»ÑŒÐ½Ð¾Ð¼ Ñ�Ð°Ð¹Ñ‚Ðµ, Ð¸Ð·ÑƒÑ‡Ð¸Ñ‚Ðµ Ð¿Ñ€Ð°Ð²Ð¸Ð»Ð° Ð¸Ð³Ñ€Ñ‹.Ð¡ÐµÐ³Ð¾Ð´Ð½Ñ� Ð¿Ñ€Ð°ÐºÑ‚Ð¸Ñ‡ÐµÑ�ÐºÐ¸ Ð²Ñ�Ðµ Ð¸Ð³Ñ€Ð¾Ð²Ñ‹Ðµ Ð°Ð²Ñ‚Ð¾Ð¼Ð°Ñ‚Ñ‹ Ð·Ð°Â Ñ€ÐµÐ´ÐºÐ¸Ð¼ Ð¸Ñ�ÐºÐ»ÑŽÑ‡ÐµÐ½Ð¸ÐµÐ¼ Ð²Ñ€Ð¾Ð´Ðµ Ð°Ñ�Ñ€Ð¾Ñ...Ð¾ÐºÐºÐµÑ� Ð¿Ñ€ÐµÐ´Ð¾Ñ�Ñ‚Ð°Ð²Ð»Ñ�ÑŽÑ‚ Ð¿Ð¾Ð»ÑŒÐ·Ð¾Ð²Ð°Ñ‚ÐµÐ»Ñ�Ð¼ ÐºÐ¾Ð¼Ð¿ÑŒÑŽÑ‚ÐµÑ€Ð½Ñ‹Ðµ Ð²Ð¸Ð´ÐµÐ¾Ð¸Ð³Ñ€Ñ‹ Ñ�Ð¾Â Ñ�Ñ‚Ð¸Ð»Ð¸Ð·Ð¾Ð²Ð°Ð½Ð½Ñ‹Ð¼Ð¸ Ð¿Ð¾Ð´Â Ñ€ÑƒÐ»ÑŒ, ÑˆÑ‚ÑƒÑ€Ð²Ð°Ð» Ð¸Ð»Ð¸ Ð²Ð¸Ð½Ñ‚Ð¾Ð²ÐºÑƒ ÑƒÑ�Ñ‚Ñ€Ð¾Ð¹Ñ�Ñ‚Ð²Ð°Ð¼Ð¸ Ð²Ð²Ð¾Ð´Ð°.Ð�Ð¾Â ÐºÐ¾Ð¼Ð¿ÑŒÑŽÑ‚ÐµÑ€Ð°Ð¼ Ð¿Ñ€ÐµÐ´ÑˆÐµÑ�Ñ‚Ð²Ð¾Ð²Ð°Ð»Ð° Ñ†ÐµÐ»Ð°Ñ� Ñ�Ð¿Ð¾Ñ...Ð° Ð²Â Ð¸Ñ�Ñ‚Ð¾Ñ€Ð¸Ð¸ Ñ€Ð°Ð·Ð²Ð»ÐµÐºÐ°Ñ‚ÐµÐ»ÑŒÐ½Ñ‹Ñ... Ð¼Ð°ÑˆÐ¸Ð½.ÐžÐ½Ð¸ Ð·Ð°Ð¿ÑƒÑ�ÐºÐ°ÑŽÑ‚Ñ�Ñ� Ð±ÐµÐ· Ñ€ÐµÐ³Ð¸Ñ�Ñ‚Ñ€Ð°Ñ†Ð¸Ð¸ Ð°ÐºÐºÐ°ÑƒÐ½Ñ‚Ð° Ð½Ð° Ñ�Ð°Ð¹Ñ‚Ðµ Ð¸ Ð¿Ð¾Ð¿Ð¾Ð»Ð½ÐµÐ½Ð¸Ñ� Ñ�Ñ‡ÐµÑ‚Ð°.ÐšÑƒÑ€Ð¾Ð»ÐµÑ�Ð¸Ñ‚ÑŒ Ð´Ð°Ñ€Ð¾Ð¼ Ð² Ð¸Ð½Ñ‚ÐµÑ€Ð½ÐµÑ‚-ÐºÐ°Ð·Ð¸Ð½Ð¾ ZolotoLoto Ð¼Ð¾Ð¶ÐµÑ‚ Ð¸ Ñ‚Ð¾Ñ‚ Ð¸ Ð´Ñ€ÑƒÐ³Ð¾Ð¹ Ð¶ÐµÐ»Ð°ÑŽÑ‰Ð¸Ð¹.Ð� Ñ‡Ðµ Ñ� Ð±ÑƒÐ´Ñƒ Ð²Ñ�Ðµ Ð¸Ñ�Ñ...Ð¾Ð´Ð½Ð¸ÐºÐ¸ Ð¿Ð°Ð»Ð¸Ñ‚ÑŒ.Ð--Ð°Ñ...Ð¾Ð´Ð¸ÑˆÑŒ Ð² Ð¾Ñ‚Ð´ÐµÐ»ÑŒÐ½Ñ‹Ð¹ Ñ�Ð»Ð¾Ñ‚ Ð¿Ð¾ Ñ€Ð°Ð·Ñƒ - Ð¸Ð·Ð¸ Ð²Ð¸Ð½, Ð´Ð° Ð¸ Ñ�Ð²Ð½Ð¾ Ñ‚Ð°Ð¼ Ð½Ðµ 1 Ð±Ð°Ñ€Ñ‹Ñˆ Ð¾Ñ‚Ð´Ð°Ñ‡Ð¸ Ð¸ Ð²Ñ‹Ð¸Ð³Ñ€Ñ‹ÑˆÐ¸ Ð±Ñ‹Ð²Ð°ÑŽÑ‚ Ð¿Ð¾ 200+ Ð¿Ñ€Ð¾Ñ†ÐµÐ½Ñ‚Ð¾Ð², Ñ€Ð°Ð·Ð¼ÐµÑ€Ñ‹ Ñ�Ñ‚Ð°Ð²Ð¾Ðº Ñ‚Ð°Ð¼ Ñ‚Ð¾Ð¶Ðµ Ñ€ÐµÐ³ÑƒÐ»Ð¸Ñ€ÑƒÑŽÑ‚Ñ�Ñ�, Ð½Ðµ Ð²Ñ�Ðµ Ñ‚Ð°Ðº Ð¿Ñ€Ð¾Ñ�Ñ‚Ð¾.ÐšÐ°Ð¶Ð´Ð°Ñ� Ð¿Ð¾Ñ�Ð»ÐµÐ´ÑƒÑŽÑ‰Ð°Ñ� Ð¸Ð³Ñ€Ð° Ñ�Ñ‚Ð°Ñ‚Ð¸Ñ�Ñ‚Ð¸Ñ‡ÐµÑ�ÐºÐ¸ Ñ�Ñ‚Ð¾ Ð¸Ð³Ñ€Ð° Ð½Ð°Ð¿Ñ€Ð¾Ñ‚Ð¸Ð² ÐºÐ»Ð¸ÐµÐ½Ñ‚Ð°, Ñ‡ÐµÐ¼ Ð±Ð¾Ð»ÑŒÑˆÐµ Ð¸Ð³Ñ€Ð°ÐµÑˆÑŒ, Ñ‚ÐµÐ¼ Ð±Ð¾Ð»ÑŒÑˆÐµ Ð¿Ñ€Ð¾Ð¸Ð³Ñ€Ñ‹Ð²Ð°ÐµÑˆÑŒ, Ð²Ñ�Ñ' Ð¾Ñ�Ñ‚Ð°Ð»ÑŒÐ½Ð¾ÐµÂ -- Ñ„Ð¸Ð»Ð¾Ñ�Ð¾Ñ„Ð¸Ñ� Ð¸ Ñ�Ð°Ð¼Ð¾ÑƒÑ�Ð¿Ð¾ÐºÐ¾ÐµÐ½Ð¸Ðµ.Ð"Ð»Ð°Ð²Ð½Ð¾ÐµÂ -- Ð¿Ñ�Ð¸Ñ...Ð¾Ð»Ð¾Ð³Ð¸Ñ‡ÐµÑ�ÐºÐ¾Ðµ Ñ�Ð¾Ñ�Ñ‚Ð¾Ñ�Ð½Ð¸Ðµ, Ð½Ð°Ñ�Ñ‚Ñ€Ð¾Ð¹ Ð¸ Ñ„Ð¸Ð»Ð¾Ñ�Ð¾Ñ„Ñ�ÐºÐ¸Ð¹ Ð¿Ð¾Ð´Ñ...Ð¾Ð´ Ðº Ð¸Ð³Ñ€Ðµ. <a href=https://vk.com/casinororg> </a> , . casino , . casino, , . casino , . , . , <a href=https://www.facebook.com/groups/casinor.net/> </a>. , . . , . Novomatic, IgroSoft, Microgaming . : - . . "." "SKUKI." , (, , / , . (, , . , - « » . , . , . . . , , («») . , . . . .